Happy New Year to Everyone and Best Wishes for a great 2018! Let’s hope that the stock market will continue 2017’s upward trend in 2018, even if it’s with a noticeably lesser pace. For no doubt, the 2017 increase of 21.8% in the S&P 500 Index (when including dividends) may be hard to replicate. But do keep in mind: it often pays to be optimistic. As depicted, only HSBC expects the S&P 500 Index to decline a bit during 2018. Yet most analysts also expect the stock market to be more volatile in 2018 than has been experienced these last few years. That’s one forecast that will likely be realized, since in 2017 there were only four trading days when the S&P 500 Index fell by at least 1%. By comparison, in 2008 the S&P 500 Index fell by more than 1% over 75 times. Moreover, on average in every year since 1998, the number of days that the S&P 500 Index has fallen by 1% or more approximates 35 days per year, or approximately once every 7 or 8 trading days. Many analysts also expect the stock market to have a 10% correction at some point in 2018, and then rebound and deliver some gains by the end of December. Market volatility should be expected this year. Fortunately though, fewer than one-third of the economists expect America to see a recession within the next twelve months. Many economists track the shape and slope of the yield curve to gauge the likelihood of a recession, and in a Bloomberg survey compiled in December, about one-half of the analysts thought investors should expect an inverted yield curve at some point in 2019, but not in 2018. Obviously time will tell, but as is usually the case, 2018 will offer up its own challenges and opportunities for investors. This year has also begun with some strong economic momentum. At 2017’s year end, consumer confidence levels were at sixteen year highs when consumers assessed their own present situations. And “Personal- consumption expenditures, a measure of household spending on items such as airfares and washing machines, increased 4.5% in November from a year earlier, an increase from year-over-year gains of 4% during last summer.” – WSJ of 12/26/17. Retail sales this past Holiday Season were also the best on record since 2011 according to Mastercard Spending Pulse, which noted that sales grew by 4.9% from Nov. 1st through Christmas, versus the 3.7% rate for 2016. Both new and existing home sales in 2017 were also the strongest they’ve been in ten years. And durable goods orders grew by over 5% in 2017, with new orders for non-defense capital goods also growing by more than 5% when excluding aircraft purchases. Such strength, particularly in the fourth quarter, suggests that companies will increase their capital spending and investment levels during 2018. Most importantly, the “Tax Cuts and Jobs Act” that was signed into law on December 23rd will also help support economic growth. Strategas Research identified 79 companies that reacted quickly to the legislation by announcing year-end bonuses and higher hourly wages for non-executive employees, announcing investments in employee training and workplace infrastructure improvements, or by expanding contributions to community non-profits because of the new legislation. The Travelers, Fifth Third Bancorp, PNC Financial, BB&T and Wells Fargo all announced that they will increase the minimum wage they pay to $15 per hour. These companies, along with Comcast, AT&T, Boeing, Sinclair Broadcast Group, and Bank of America are also paying a $1000 year-end bonus to each of their non-executive employees. 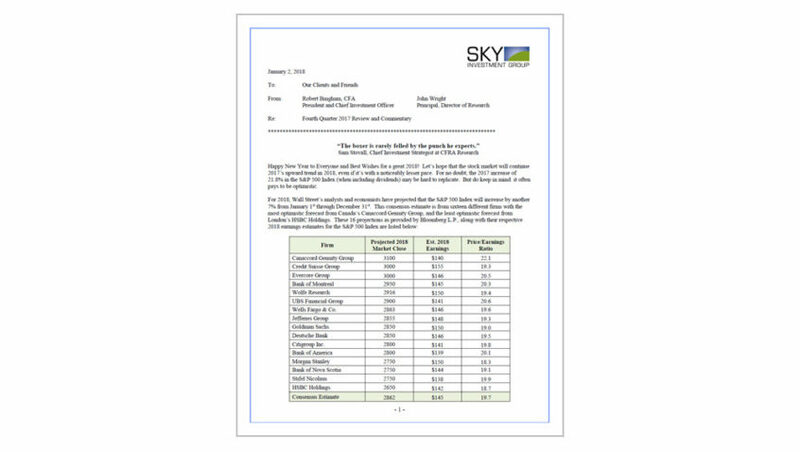 The total number of workers to receive these bonuses from these companies alone approximates 481,500 individuals, or more than $480 million in paid-out dollars. Comcast also announced plans to spend more than $5 billion over the next five years on capital projects and upgrades to their infrastructure. AT&T announced similar plans for $1 billion of expenditures, and Wells Fargo announced that they would invest $400 million in their community and infrastructure. Federal Express, Verizon and Delta Airlines also made larger than anticipated year-end contributions to their employee pension plans. Our economy will benefit from these expenditures and the lower tax rates that the new legislation brings. At 21%, the new corporate tax rate will be the lowest it’s been in 60 years. That change alone will improve corporate profits, and in turn, help support current stock prices. 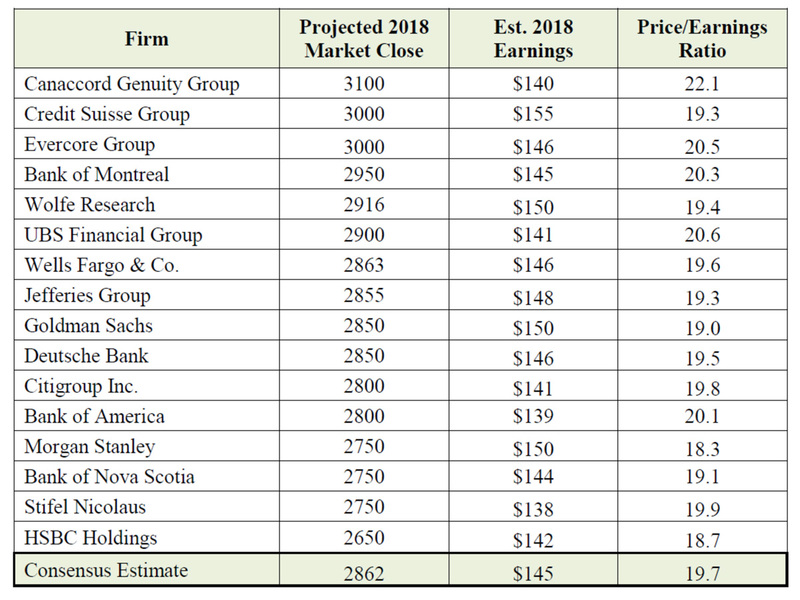 As an example, both Goldman Sachs and Keefe Bruyette & Woods now expect bank industry earnings to grow by more than 13% in both 2018 and in 2019. The lower individual tax rates appear to benefit nearly every American as well. 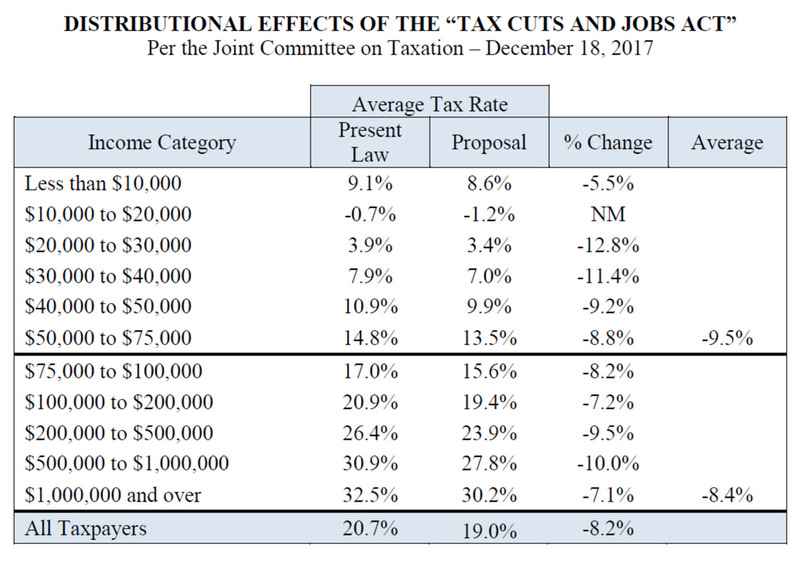 Congress’ nonpartisan Joint Committee on Taxation has calculated the distributional impact from this new legislation and determined that the average tax cut for all Americans will be 8.2%. Their calculations are listed below, and as depicted, the average tax cut for lower income Americans will be 9.5% vs. the average tax cut for upper income Americans of 8.4%. Indeed, this broad-based legislation will increase take-home pay for about 80% of all Americans, while approximately 5% of all Americans will pay higher taxes, according to the privately funded Urban-Brookings Tax Policy Center. Yet as calculated, the “Tax Cuts and Jobs Act” will also increase our country’s deficit by approximately $1.5 trillion over the next 10 years. However, if our country’s economic growth rate does improve from this legislation, then the incremental tax receipts will lower that $1.5 trillion estimate. Undoubtedly, there will also be additional legislative changes that will impact these numbers over the next ten years as well. Currently, our Congressional Budget Office has forecasted that the US Treasury will collect $43 trillion in tax receipts over these next ten years. So, this $1.5 trillion amount approximates 3.5% of our expected future receipts. If our economy does grow more quickly than the CBO’s projected 1.9% growth rate for the next ten years, then our country’s future tax receipts will exceed this currently estimated $43 trillion. Many unknowns are still to be determined from this new legislation, but from our vantage point, individuals, corporations and the US economy will all benefit from these changes. Certainly, the law’s full impact won’t be fully understood for a while. Each of us will be impacted differently. But to the stock market’s credit, these changes were anticipated and did help support the market’s strong move in 2017. For 2018, the stock market will now focus on other factors that will influence the market’s short- and long-term directions. Consumer spending levels will be scrutinized in 2018, along with business expenditures for capital improvements. Employment trends will be analyzed across industry sectors and geographic regions. Central bank policies will be watched as governments worldwide reduce their bond purchases and their levels of monetary stimulus. And many questions will need to be answered. Will the stronger economic growth materialize as expected? Will unemployment levels in the United States continue to decline towards the 3.3% levels of the 1950’s? Will inflation accelerate more than expected? Will interest rates increase more or less than expected? Might investors scramble to reduce their high levels of margin debt in an unanticipated and panicked way? Will new legislation be passed that increases our country’s level of infrastructure spending? Will disaster relief legislation be passed? Will increased government deficits crowd out private sector borrowing? Will Congress finally pass a budget to fund the United States? Might Europe bring charges against the United States for unfair and overly competitive tax laws? Will geopolitical issues in North Korea, China, Iran, or the Middle East erupt in turmoil? Will the United States be able to provide effective world leadership? Truly, there are many unknowns, issues and uncertainties. Some of these factors may influence the bond and/or the stock markets, and some will not. But as we’ve written before, the best way for investors to grow and protect their productive assets is to invest in a diverse group of above-average companies. Such investments should generate ample and growing levels of cash flow, along with good investment returns over time. While no one should expect the stock market to always climb in a steady and comfortable way, price changes and volatility do also provide opportunities. If you have questions, or would like to visit about your own portfolio, please do let us know. Again, we wish you the very best for a healthy and prosperous New Year!